In September of 2018 we saw the launch campaign of Pibank, the new online bank of Pichincha group, culminating the development of a brand strategy process with three television spots. This was achieved alongside the management team of the new bank over several months and was implemented both in banking operations and communications. Pibank chose Darwin Social Noise to lead all their advertising communications between several agencies that participated in a marketing contest at the end of last year. The challenge for the brand and for us was launching a bank that operates solely in a digital environment in 2018, which is mainly aimed at a public used to operating on the internet and mobile devices and that demands product excellence. 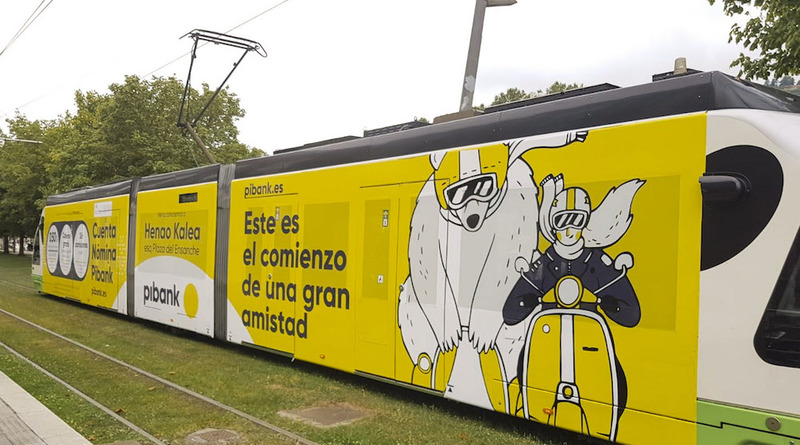 After months of strategic work and research, we came up with the claim: ‘Mejor más fácil’ (“Better easier), which goes beyond being a simple publicity statement and represents the bank’s commitment to its customers. As part of their strategy to launch simple products among the best of its segment, we announced the launch the new bank with the payroll account campaign, consisting of three spots (‘Kiss’, ‘Promotion’, ‘Baby’) in which the positioning is accurately represented with a tone of humour and by the different attributes of the product. The pieces, produced by Lobo Kane and directed by film director Paco Caballero, were broadcasted on national tv networks and the Internet for several weeks. 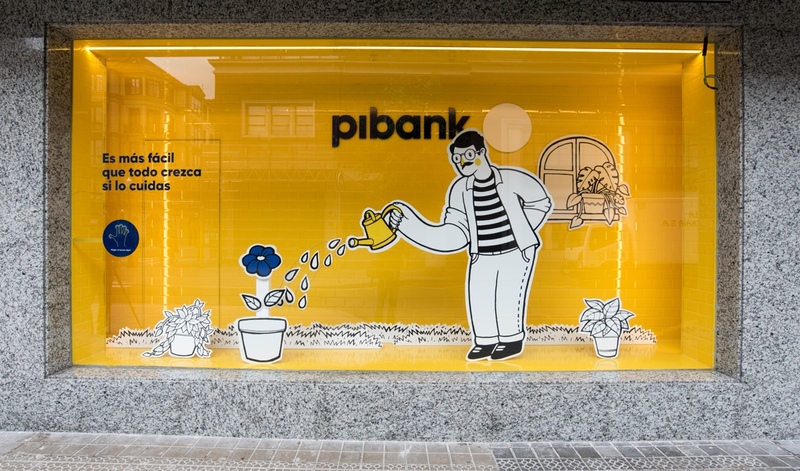 In addition to the payroll account campaign, we have also been implementing innovations on the show-windows of the five offices which Pibank has open in Spain (Madrid, Barcelona, Bilbao, Zaragoza, Valencia). Under the concept of ‘Shop-windows that tell stories’ we have made an interactive visual metaphor about the relevance of the ‘Mejor más fácil’ concept in peoples’ lives. Each story, illustrated by Jotaká, comes to life when activated by pedestrians from the street. 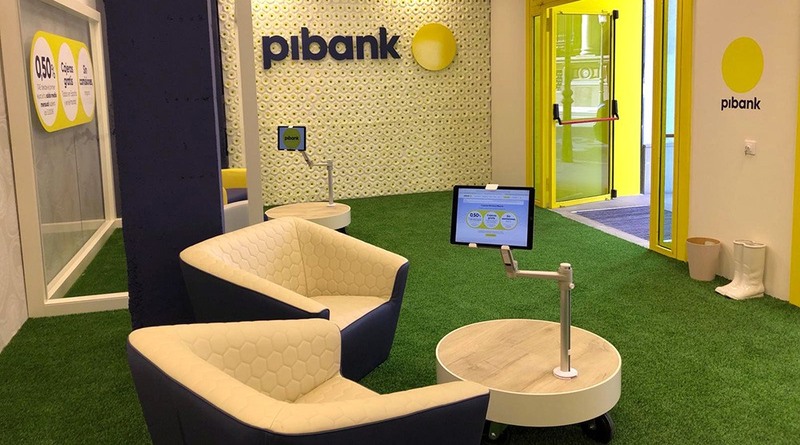 Thanks to robotics and touch technology, the offices of Pibank represent a revolution in the design of bank offices. They have no ATMs, no cash, nor paper of any kind; They are completely digital, and consultants help customers using iPads from the comfort of their sofas. We also designed the bank’s credit and debit cards with luminescent inks that make them glow in the dark, along with having made outdoor advertising pieces, web infographics, digital pieces, posters, material for events, etc. We are very happy with the work done by Darwin Social Noise along with the direction of Paco Caballero and Lobo Kane. They managed to find the perfect balance between a fun and entertaining campaign while making clear what are the characteristics of the flagship product, the Pibank Payroll Account. “-Begoña Martínez Cogorro, General Director of Pibank.